are the ones who hear the word and accept it and bear fruit thirty and sixty and a hundredfold." In my reflection for today's Gospel, there are three things that I considered: First is the seed, second is the type of soil, and third is that I am the gardener. In the case here, I am the sower. As I ponder on it, the seed is the Word of God which is generously open for everyone. And me as the sower, is the one responsible on how to develop, take care, and use it. It is I who is responsible to live the Word of God. That is when the rich soil comes in. I must be able to sow the Word of God on rich soil and make it fruitful. As I prayed about it more, I realized where I am in my faith. I feel like I am the rocky ground. 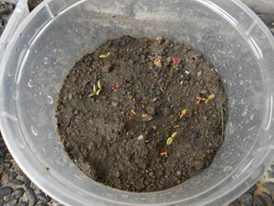 "It sprang up at once because the soil was not deep. And when the sun rose, it was scorched and it withered for lack of roots. " I am so engrossed to knowing more about the Word of God, yet there were more times that my faith falters as I learn more. I have these so many knowledge yet it was raw and my foundation seems rocky. And it makes me more guilty because it is worse to do something wrong knowing it was wrong rather than doing something wrong not knowing it was wrong. The Word of God is there, in front of us. However, it is not very easy for me to live It. I pray that as I continue learning, I may also live the Will of God and share it to others.